video of the day. AM V8. From the foto of the day to the video of the day—-another Aston Martin. Today in traffic I saw a newer model Aston Martin V8 Vantage and was reminded of just how beautiful that car is. It’s been around for a few years now, and people have lots of opinions about it—-but does it really matter when a car looks THIS good and sounds THAT good? Nope! 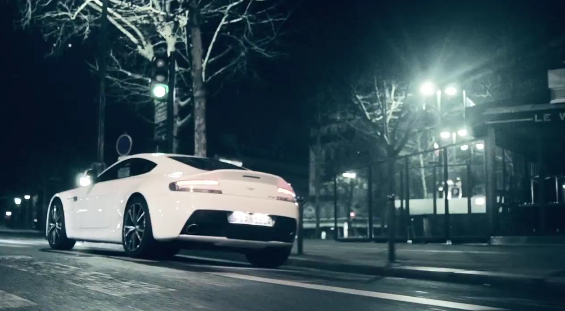 This is the promo video unveiled in Paris for the 2012 Paris Auto Show of the 2012 Aston Martin V8 Vantage. A “C’etait un rendezvous” homage? Agreed. Great looking car, terrific engine sounds. The lady ain’t bad either! Yes I love that they did a C’etait un rendez-vous reference but without trying to slavishly match any of the shots from the movie. The true fans will get it, and they did. Well done, Aston Martin! I really love this car, the sound and looks are quite amazing.